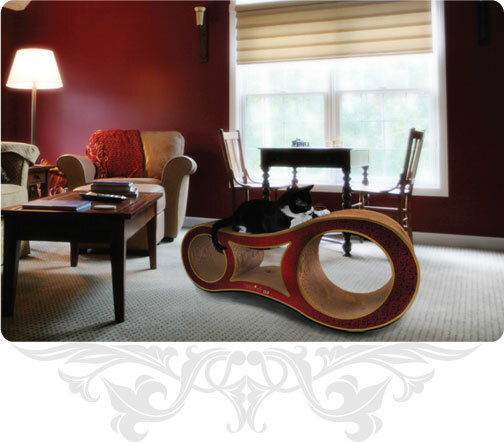 For 30 years, Imperial Cat has manufactured eco-friendly and all-natural cat products of exceptional quality. We are dedicated to creating safe, fun and functional products that enhance the lives of cats and the people that love them. From scratching and playing, to snacking and grooming, nobody offers more ways to promote the happy, lifestyle of a feline than Imperial Cat! As a family-owned and operated company, we retain a level of customer service and product quality that remains unmatched by our competitors. Our business depends on customer satisfaction and the success of our products which is why we are committed to ensuring you are 100% satisfied. At Imperial Cat, cats are part of our family. We are not just manufacturers; we are cat owners and lovers, too. In addition to our hard-working human staff, we employ a team of 20+ office cats that put our products through rigorous tests to ensure they are cat-approved! View our line of NEW SHAPES & PATTERNS! You are certain to find something that both you and your cat will enjoy! • Need a gift for that purrfect someone? We can help you out! Check out our Spring Items! "My cats absolutely love your Organic Catnip (and only yours! ), it always makes their moods better!" "Here is one of Gingerman, a red tabby rescue who loves to sleep on his Tiger, not to mention scratching on it!" "A few months ago I bought my cats one of your Scratch 'n Pads boxes and they adore it!!" "Since we got him one, he's loved it! He sleeps, bathes, and plays on it all the time! Nico and I just wanted to say thanks for his new place to hang out!" Click here to find out more information about our Adopt-A-Cat Program! We love hearing feedback from you! Feel free to submit your comments and pictures to us. Email us your stories and pictures to info@imperialcat.com or share with us on Facebook.